To all but his political enemies, the government of Mexico and a few soreheads, the 44-year-old Tennessee transplant stood tall both literally and figuratively as Texas’ greatest living hero. That spring, lacking numerical superiority but not grit, he had defeated Gen. Antonio Lopez de Santa Anna at San Jacinto and now served as the first elected president of the fledgling nation he had helped create. But Sam Houston was yet a mortal with his share of human foibles, including overindulgence in distilled spirits. And, well, he buckled and unbuckled his belt just like any other man. When nature called, he and other officials of the new Republic of Texas repaired to the nearest privy, a facility more commonly known today as an outhouse. At intervals as regular as the president happened to be, while living in what is now West Columbia during the fall and early winter of 1836 Houston responded to urges that had nothing to do with nation-building. Taking a break from the affairs of state, he sat in a small, smelly wooden enclosure built over a hole dug in the rich Brazoria County soil and made it all the richer. Given his propensity to drink, it is quite plausible that while so engaged, he drew one last swig on a bottle and dropped it down the hole, an old soldier unceremoniously laying a “dead soldier” to rest. While the name of its former owner will never been known, 171 years later an archeologist uncovered from an old privy pit near what once had been the seat of government of the Republic of Texas, one intact blown-glass bottle that dates from the mid-1830s along with several pieces of glass from the same era. 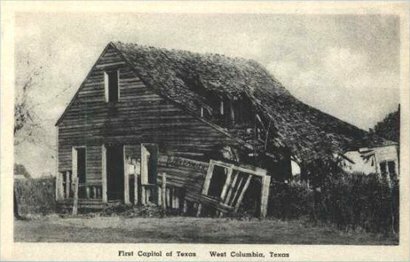 Boyd is vice president of Prewitt and Associates, an archeological consulting firm that surveyed the presumed location in West Columbia of a structure long referred to as the first capitol of the Texas republic. In truth, the building constituted only half of the capitol, and there’s no way to prove scientifically that Houston discarded that bottle, but it is incontrovertible that Houston took his oath of office on the site. Thanks to a developer’s donation of a 337- by 35-foot strip of land along State Highway 35, the historic spot has been transformed into Capitol of Texas Park. Dedicated on April 17, 2009, the park features a path connecting a series of granite monuments telling the history of the area. 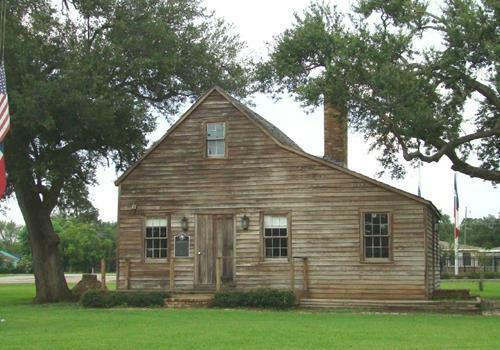 That history goes back to 1824, when Josiah Bell settled on the nearby Brazos River at a point soon known as Bell’s Landing. A community at first called Marion and then East Columbia eventually merged with the nearby settlement of Columbia, later renamed West Columbia. The nation’s business was done in several frame structures put up a few years earlier. The House of Representatives met in a one-and-a-half story structure built in 1833 previously occupied by a merchant named Leman Kelsey. Across the road from the House, the Senate conducted its august proceedings in a two-story store formerly used by the firm of White and Knight. The rented government buildings reverted to private use, the structure that had accommodated the republic’s upper house being torn down in 1888. The former lower chamber survived beyond that, but it had deteriorated considerably. In 1897, a Houston photographer named F.E. Beach took a picture of the old structure – a gaping hole in its roof – and labeled it “First Capitol of Texas.” He sold cardboard-mounted copies for 25 cents. The Daughters of the Republic of Texas, saviors of the Alamo, had their collective sights on the old building when the September 1900 Galveston hurricane destroyed it. Fortunately, Beach’s image and several other photographs survived. Those structures were razed in 2007 to make way for a new chain drug store. When the existing pavement was ripped up, workers discovered an old cistern and assorted artifacts. Boyd’s firm got hired to do an archeological survey. With help from the Brazosport Archeological Society, Prewitt and Associates spent a week that December looking for traces of the government structures. They excavated the brick-lined cistern, which they believe dates from early-to-mid 1830s, along with privy remnants and numerous postholes. Boyd said more archeological work remains to be done in the area, but that will have to wait on funding. Until then, any other bottles Old Sam might have stashed – not to mention more interesting artifacts – will remain buried.